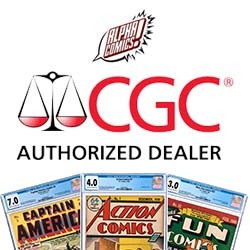 Usually an annual in a comic book series is just another story to be told for that character (or characters). Whether that story is extra long or some sort of gimmick, it’s usually nothing earth shattering. 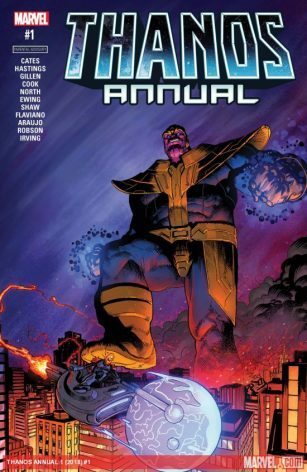 Thanos: Annual is not earth shattering, but it is a fun break from the normal dark Thanos fare. Several stories have been connected by a single concept – which works very well. The concept has Cosmic Ghost Rider telling a story to an unknown audience. This story recounts some of Thanos’ most nihilistic moments from his history. Cosmic Ghost Rider does his best Deadpool impression as his method for storytelling. Each story is introduced by Cosmic and he continues to narrate sections throughout. Basically each story recounts a way that Thanos has ruined someone’s (or many someones) life. For the most part it’s deadpan funny. And in the end (not really a spoiler since the book is about Thanos), we find out the “audience” is Odin. Odin and Cosmic Ghost Rider walk off into a doorway to Valhalla. With the subtitle “continued in Cosmic Ghost Rider #1.” So while this is a Thanos book – its also a Cosmic Ghost Rider #0. So there’s that. Because of the nature of the book with multiple stories, the art and style is ALL over the place. Every story is a new artist – from the silly “My Little Thanos” to the ethereal “The Comfort of the Good.” The other stories use an art style much more like the regular Thanos books. The writing melds well across stories – each story maintains Thanos wicked nature, while maintaining the dark humour across each concept. I only have one real complaint about this book. All the lettering for Cosmic Ghost Rider is dark red on black. Seriously? After reading a few pages his dialog, I felt an aneurysm coming on. Hard to read is an understatement. There is more than enough to like in this book. Thanos fan? Check. Cosmic Ghost Rider fan? Check. Like an irreverant and funny book? Check. Well worth your hard earned dollars this Wednesday.